“Angstland Germany.” When the Dutch author Cees Nooteboom wrote down this insight during his one-and-a-half-year stay in Berlin in 1989 and 1990 as a scholarship holder of the German Academic Exchange Service (DAAD), he not only laid the foundations for his rise to international writing stardom. His Berlijnse notities (Berlin Notes) on politics and everyday life in Germany have since become almost a metaphor for the spin-off effects of cultural exchange: the free space in which a work grows, the enlightening power of a change of perspective, the gift of the foreigner’s gaze for the host country. In Nooteboom’s day, this kind of artist support was comparatively new and rare. The scale that the residency format of local, multi-month artist scholarships has assumed could be seen last night in Berlin’s theatre Hebbel am Ufer (HAU). Around twenty German institutions were there to promote this special form of artist support. Guests at HAU Hebbel am Ufer | Photo: Victoria Tomaschko The public usually associates prestige projects like Villa Massimo in Rome or Villa Aurora in Los Angeles with the vocabulary of artist residences. Fewer people have heard of Akademie Schloss Solitude in Stuttgart, Iwalewa Haus in Bayreuth or the international artists’ house Villa Concordia in Bamberg, Bavaria. At the initiative of the Federal Foreign Office and the Goethe-Institut, these and other institutions joined forces in 2015 to form a working group of German international residency programmes (Arbeitskreis deutscher internationaler Residenzprogramme) in order to better share amongst one another and publicise this form of cultural diplomacy. There are more than forty of them in Germany alone, the country with the highest density of artist residencies. There are residency programmes under German sponsorship in eighty countries worldwide. “Residency programmes promote openness, dialogue and cultural understanding. We need people who can engage in dialogue, deal with cultural differences and are open to new experiences. 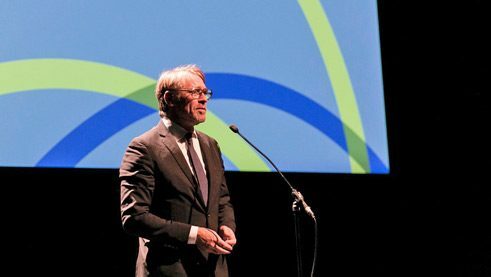 Especially in times of political turmoil, cultural exchange through residency programmes plays an increasingly important role,” said Johannes Ebert, secretary-general of the Goethe-Institut. The motto of the evening was Andauernde Grenzüberschreitung or Constantly Crossing Boundaries. It began with Gülhan Kadim, Berfin Zenderlioğlu and Laila Nielsen illustrating the motto by coming unusually close to participants waiting in the lobby in a fast-paced dance performance. 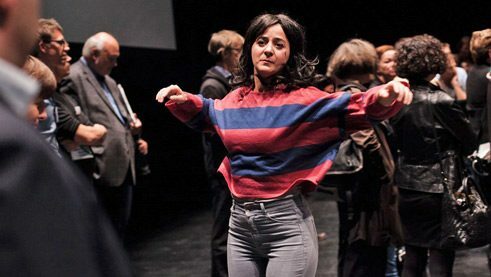 During his residency at the Haus der Kunststiftung Nordrhein-Westfalen, the Bonn theatre director Frank Heuel had met the young actresses of the Turkish theater group Kumbaracı50. He has been working with them ever since. The impact the residency has on you is important. This freedom is not taken for granted everywhere in the world. For this reason, as Johannes Ebert announced, the Institute for Foreign Cultural Relations (ifa) and the Goethe-Institut have newly launched the Martin Roth Initiative. With it, they want to offer cultural professionals committed to artistic freedom, democracy and human rights in their homelands temporary protective stays in Germany or in third countries. American artist Tracey Snelling contributed the appropriate metaphor to the evening for this growing exchange and mutual observation. Her multimedia installation “Kotti” (2018), which she had produced during her stay at the Künstlerhaus Bethanien, stood in the lobby of the HAU. The strikingly realistic replica of the distinctive social housing building Neues Kreuzberger Zentrum by Berlin’s notorious Kottbusser Tor looks like a kind of residence, where through the windows of each of the many flats with their typical satellite dishes we may see a video flickering, then see someone drawing, or residents sitting around a table. Oh – this is how Snelling’s work could be interpreted, if only the whole world were an artists’ house!